The blogger otherwise known as the Scientist Gone Wordy and I rejoin for another movie title that began its life between a book cover for our parallel post series. Thankfully closing out March, the first quarter of 2014, and winter. Well, at least for those of us in the northern hemisphere. Sorry about that, Rachel. 😉 This time we’ll examine the first novel by Italian author Umberto Eco. A brief synopsis of the film: Adso of Melk, looking back on his long scholarly life, recounts his turning point as a young novice. Early in the 14th Century, he and his mentor, the esteemed Franciscan friar William of Baskerville, arrive at a notable Benedictine abbey in Northern Italy for an important theological Church conference. They find a community clearly troubled by a mysterious death that occurred ahead of their arrival. William, widely known for his deductive and analytic mind, confronts the worried Abbot and gains permission to investigate the death of the young illuminator. At first, suicide is suspected. But, over the next few days several other bizarre deaths occur. Everything is not what it seems in the abbey. Then, as an old adversary of William’s arrives, the stakes become more dire for both the teacher and his learner seeking the truth of the matter. It’s with some pride I picked this somewhat obscure movie title (one that thankfully received high-def treatment in 2011). Being that I was one of the very few who actually saw it first run in theaters back in the 80s. What can I say? It’s a penchant of mine. Per Wikipedia, “The film did poorly at the box office in the United States, playing at only 176 theatres and grossing only $7.2 million in return on a $17 million budget.” I enjoyed it then, as I continue to do so now. Probably the one chief aspect of a good historic period piece is that it’s immersive. The author Umberto Eco accomplished that with a very descriptive story using a medieval setting on the page. And director Jean-Jacques Annaud (Quest for Fire, Enemy at the Gates) may have done it one better with this film adaptation. I don’t say that lightly because The Name of the Rose was more agreeable on the big screen, at least for me. Usually, it’s the other way around, but here not. While the novel was stylishly written (even if I don’t know a thing about native Italian verse), a ‘light’ read it’s not. Where the novelist’s tendency veered toward the expressively detailed, and go off on effusive tangents before returning to the mystery at hand, Annaud and cinematographer Tonino Delli Colli beautifully shorthanded the human and surrounding landscape Eco wove with stunning visuals. Deftly employing the distinct characters of the story onto celluloid. Translating the book’s setting, the cold mountainous region of Italy (with Germany’s Eberbach Abbey standing in for some striking interiors) was never better captured than here. Some of the largest sets since Cleopatra, built just outside of Rome, were constructed for the motion picture. They paid off. The monastery centers the film like none other. It dominates those all around the film, part of the real reason they were built that way. To withstand weather, and people’s doubt in the church. Immense buildings dedicated to God, which represent his power and importance in the world, and the puny stature of man dwarfed by it all. 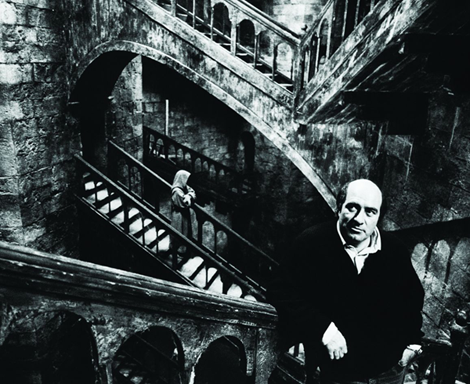 The cruel and capricious nature of Eco’s story never far away, especially within the walls of the abbey. In a location and setting that was just another formidable character in The Name of the Rose. And there are a load of them throughout the film. By the way, their initial greeting, when Sean and Drax, one of the better Bond villains of the Roger Moore era, give each other lip salutation, it sent all OO7 fans hearts aflutter. Doesn’t take much to discern this tale of mystery was another variant of Sir Arthur Conan Doyle’s famed character of literature. 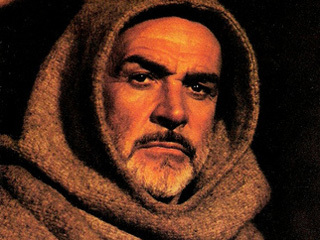 William of Baskerville1 (Sean Connery portraying the antithesis of his most famous role) was an amalgam of Sherlock Holmes and William of Occam (who is readily known to those of us who’ve watched Contact). Add in Michael Lonsdale, F. Murray Abraham, William Hickey, Feodor Chaliapin Jr., Ron Perlman, and a 15-year-old Christian Slater2, and you had quite a cast to fill out Eco’s earthy roles. Though it takes some patience, along with the usual clue watching, The Name of the Rose remains a more than worthy film to take in and enjoy. Primarily, through its fitting and most permeable attribute. Realism. It built an atmosphere where you feel the cold, the poverty, and the absolute and stern belief of its characters. Be they the poor or the clergy, whether Franciscan, Benedictine, or Dominican. The irony of this adaptation, and lack of immediate box office success, was the book it’s often compared with, Dan Brown’s The Da Vinci Code. Both related to mysteries tied to biblical reference and context, but only Brown’s (and Ron Howard’s) film caught fire. The author’s unique and thoughtful plot, which introduced a portion of the enlightenment coming that would pull the dark out of the Dark Ages within its 600+ pages, as well as sui generis dialogue, were handled better than well by screenwriters Andrew Birkin, Gérard Brach, Howard Franklin, and Alain Godard in Jean-Jacques Annaud’s wonderful production. All the actors delivered fine performances, particularly the elder statesman Connery (whose career was faltering a bit at this stage), along with the young Slater. Rising up against the inequity of the Church’s authority, to fight the shadowy conspiracy lying within the monastery, using only guile and intelligence, The Name of the Rose proved to be one of the most underrated movies of the 80s. I’d say that one of Sean’s best performances, in a career of them, helped to make that so. I never knew the film didn’t initially perform all that well at the box office – interesting. I always liked this movie, and I agree the sets and the atmosphere they create is a big part of this. Connery is excellent too and I thought he gave a lovely performance. Awesome write-up! I really don’t remember ever seeing it. I definitely remember it though. A thoroughly underrated film, Keith. Thank you, my friend. I too was one of the few who ventured to the theaters in 1986 to see this film. I remember liking it, but that was the last time I saw it and I have virtually no memory of the story. The write up is great and it encourages me to return to it. Thanks for the analysis, I never read the book because it was huge and it’s reputation was that it was dense without being plot driven. I’ll have a look at the book review later. We might have been in the same theater! Oh, yes. Please give this one another go. It stands up to repeated viewings, Richard. Let me know if you want to see it on Blu-ray. Thanks, my friend. Surprised this did badly at the box office. I thought it had been quite successful. I do recall it finding a good home on rental though. Maybe that’s where I’m attributing it’s success to. Only in the U.S. did it do poorly. Doesn’t say much for us. Certainly, its reputation has gained on rental, thankfully. Thanks, my friend. Hiya, I have the movie at home now but haven’t had a chance to watch it yet. Even though I’ve read the book I’m still going to wait to read the review until I’ve seen it (you never know what will get changed:)). Will be back soon to do some actual commenting. I did give a little sneak peak to the beginning and I’m glad to hear the movie is better than the book. As you’ll see, I was not a big fan of the book. So jealous your winter is ending. I’m in denial that ours will be starting up soon. Looking forward to your thoughts on the film, Rachel. I’ll be heading over to your book review, shortly. And we had the driest winter on record here in SoCal (and I say that even if it rained over night). Thanks, Rachel. It is indeed, Sergio. The film captures something that I would imagine registers well in Europe and history. I didn’t see this one until it came to home video (via VHS). I remember watching it with my Army buddies in Germany. Pretty much everyone really enjoyed it, me included. Nice review, Michael. It’s been ages since I saw this but I remember being quite impressed w/ Slater’s character as it’s one of his earlier roles. But yeah Connery is great indeed, and yeah I also remember the atmospheric and gritty atmosphere which made it so realistic. Thanks, Ruth. Glad to hear you’ve seen this one. I didn’t expect it to take me this long to get to this but time just flies sometimes, huh? I thought this was a really good adaptation. It took all the good stuff and left the dull stuff behind (if I do say so myself, and I do:))! Wonderful atmosphere, genuinely creepy (even grosser than gross at times) and discomforting. I found that discomforting bit to be the best of all. I was never at ease watching it and I think that was definitely deliberate of the director. Admittedly, it should have been called the Abbey of Creeps but, aside from that, there were very few scenes in which a viewer could feel any degree of calm. I thought Slater played Adso a little too vacant but otherwise really enjoyed the acting. Oh, wait, one huge exception. That scene with “the girl” is pretty bad. It was the only place in which I didn’t think the film made it better. I am quite interested in the tips given to the actress. In my head it goes something like this: “Oh, no, no, no, way too much like a human being. I’m going to need a bit more stupidity on your face and certainly those moans/sighs/grunts need to sound a lot more like a very small pig rooting around in the mud.” I get that in this story WOMAN = TEH DEVIL (ugh!) but, at the very least, this woman was a survivor and resourceful. It’s implied that she allows herself to be used in this way so that she can provide for a family. The idea that her motivation is anything other than survival is just plain dumb. I almost threw the book/movie player across the room when the suggestion was “Oh he’s just so darn cute I’d like to give it away for free.” Please! I’m think it would be more like an investment in which she’s hoping to get good return. Again, ugh! While I found the book a bit of a chore I’m so glad you suggested this one. I had certainly heard of the novel but really didn’t know a lot about it and so was very glad to give it a try and learn more about this classic. We’ve in agreement. Good ;-). Yeah the grit, and ahem, rest, really added to authenticity and atmosphere. Ha! Love those tips, Rachel. Yeah, this lot of men looking, and acting, toward the young girl as a receptacle of The Devil was a gist the filmmakers wanted to make. Still, it was the DARK AGES. Good point, too, that she was a survivor and therefore, resourceful. I can see that. Sean does have so many great others. Thanks for the read and comment. ..Hi.I am searching for the movie sets..can somebody tell me exactly the places?..and where they do the shots in the very last scene..when the boy goes with William away with the donkey..
Outside of these listings, I’ve very little to offer. Sorry about that. Wish you well on your quest. Thank you for stopping by, though.